While there’s still a way to go until we can form a final opinion on Ubisoft’s new loot-based shooter, it’s shaping up to be a top entry in the genre. The Division 2 is a lot of fun. After around fifteen hours, running through about half of the game’s main missions and spending some time in the PvP-focused Dark Zone, Ubisoft has found a formula for the loot-based shooter that just works. It doesn’t reinvent the wheel, but it doesn’t need to. The tactical cover-based shooting is well-executed, owing to smart enemy AI, a clever toolset for players, and quality (if somewhat repetitive) mission design. It isn’t perfect: so far, its bland narrative won’t win any awards, and it’s not the most visually-striking AAA game you’ll play, but the game’s polished fundamentals will keep drawing you back. I haven’t played enough of The Division 2 to make a final judgment, but it’s shaping up to be a surprising winner. Washington D.C.’s skyline glimmers in The Division 2. One thing Ubisoft has really nailed with The Division 2 is the dynamic cover system. But more importantly, they’ve actually structured enemy encounters to force you to constantly use it. If you stay behind a piece of cover and simply fire at your enemies, you will die. They will flank you, they will rush you, and they will flush you out with grenades and special items. The enemy AI is very good here: they are relentless in their pursuit. As a newcomer to The Division franchise, I can’t compare this to the first game, but a common complaint there was bullet sponges. And yes, while some enemies are quite spongy– and not without reason, as they can be heavily coated with armor that you can break off, piece by piece– most aren’t, and can be killed with a few rounds. Special skills and abilities are a fun addition to combat and range from a defensive drone that will deflect enemy fire to a plate you can throw out in front of your enemies that reshapes into a flamethrower turret. UPDATE: One thing I felt a need to mention here as my time with the game has increased is the friendly AI. It’s bewildering. In missions where your goal is to rescue hostages, you will find that the hostages, rather than retreat and allow the heavily armored Division agents to take on waves of enemies, will instead rush into the enemies face with no armor and begin shooting. They never seem to take cover, they never seem to take the proper defensive positioning that enemy AI does, and they never seem to pay attention to your player. It’s very frustrating, when mission success benchmarks become tied to the survival of these suicidal lemmings. It’s hardly the player’s fault when your AI partners seem incapable of understanding the concept of cover. It may seem like a minor complaint, but it can be very annoying. Prowling the streets of the US capital, your drone can protect you from enemy fire. There is a large variety of events and missions within the world, which range from territory control (they unlock new fast travel waypoints and gear stashes, but must be maintained with resources found scattered in the world) to preventing roving gangs from committing public executions. Gunplay feels satisfying and weighty, with a huge variety of weapons. The game is constantly feeding you new gear, and that encourages experimentation. If you don’t switch to a newer weapon, you’ll find yourself quickly becoming underpowered and outgunned. But this goes two ways: break from cover for a few seconds to rush an enemy and if you’ve miscalculated the number of baddies you’re facing off against, you will find yourself overwhelmed very quickly. And you do not have a lot of health: a few moments of intense enemy fire and you can have your shield depleted or get knocked down. And Ubisoft smartly balances health by making it so that your main source of health, your shields, do not replenish unless you use one of your limited stock of armor kits. Health can be a scarce resource in The Division 2, so watching your HP is essential. UPDATE: As you progress through the game’s final story missions, known as strongholds, the game’s diversity doesn’t subside. Gear remains interesting, diverse, and worthwhile. Combat encounters ramp up in difficulty and enemy variety continues to impress. The only area of complaint is with the stronghold design itself: I was expecting something more akin to raids, or at least more epic set-pieces from what had come before in The Division 2. Instead, they don’t feel much different from the other story missions, aside from featuring a pretty weak attempt to tie the game’s lackluster story together. It’s worth briefly mentioning the game’s UI. Menus are stylish and well-organized, although the game’s many systems sometimes make for unclear navigation. Particularly worth noting is the excellent map system, which plots 3D models onto a map of Washington D.C. that clearly lays out your characters location, GPS routes to your destination, and lists of activities. It’s another well-designed map from Ubisoft, who have become one of the best in the business at producing beautiful and functional maps in their open world titles. 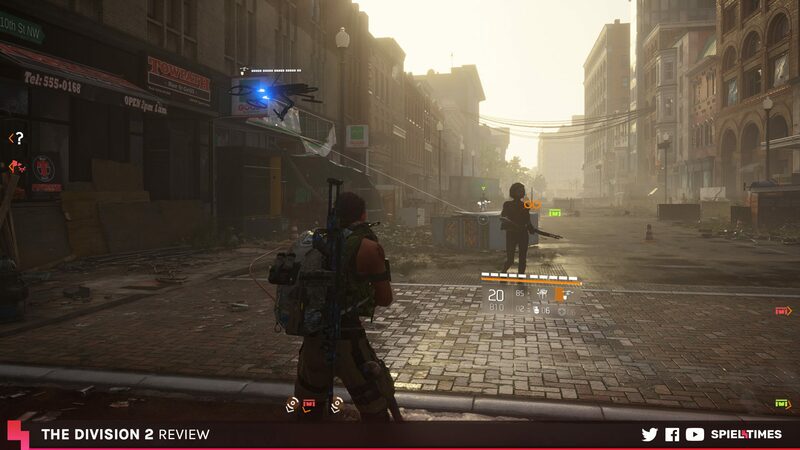 The Division 2’s map system is both stylish and functional. The open world leaves something to be desired. Washington D.C.’s landmarks are beautifully rendered, but much of the rest of the city feels generic. It isn’t the most compelling setting, and the game could start to feel samey and bland if it didn’t shuttle you away into more designed interiors, which are mostly properly designed cover-based levels with a decent variety of indoor environments. Their layouts offer both verticality and versatility in combat and movement options. UPDATE: The level design of later missions and strongholds continue to impress. You may find yourself doing battle with enemies trying to take over your position in the hollowed out husk of an abandoned Air Force One. Or in the U.S. Capitol Building, where the House of Representatives has been converted to a makeshift battlefield, replete with barriers for cover and equipment crates. Retreating behind the rostrum of the U.S. House and peeking up to shoot foes lobbing grenades at you from the visitor’s gallery is very cool. The Division 2 is neither the most graphically advanced nor striking AAA title. Textures are sometimes a bit flat, and character models and faces can seem stiff with a lack of emotion conveyed through facial animation. But at times, it looks quite good. The quality of the volumetric lighting solution here shows as light shafts peek through the skyline and give the scene a beautiful glow with a high-quality global illumination. Environments are detailed with lush vegetation and intricate buildings, but shadow quality is strangely jagged and dithered, even on high settings on PC. Another annoyance is the red hue which creeps into the screen when your character loses health. Overall visuals are still fair, and it’s worth considering the scale of The Division 2’s open world, but there are better-looking games. 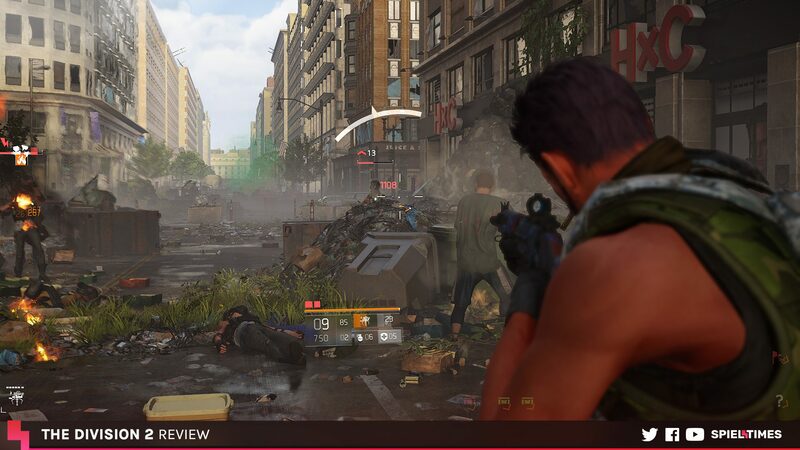 And games with better performance, as The Division 2 at launch suffers from prolonged frame rate dips at times on PC. Ubisoft has recognized that problem as it’s an issue they are addressing in future updates, and that it exists across platforms, so I’ll keep you updated on performance. The red hue that creeps into the edges of the game screen when your character loses health can be distracting at times. This is very good, although there are a few quibbles. Weapons sound excellent and true-to-life. Snipers let out a bang that gives their recoil the proper feeling of heft, while shotguns blast with a wide snare. Some pistols sound a bit too tinny, but the overall accuracy is stellar. Music is also quite good: heavy rock drums and chunky guitars blast out with cinematic synth sweeps. Strings provide a feeling of authority and significance to the proceedings. Ubisoft are pros when it comes to weapons and music, but the voice acting is a mixed bag. Most main characters are decent, but the stilted performances from side characters and incidental dialogue leave a lot to be desired at times. UPDATE: This continues to be very good. I want to draw particular attention to the score here, which I’ve only become more and more impressed by as my time playing The Division 2 went on. Ambient pads and throbbing synths provide a great sense of tension in firefights when you’re outnumbered and retreating, and thick walls of guitars cut in as you enter battle. Even some of the players I had randomly grouped up with commented on the high quality of music and sound here. The story is not The Division 2’s focus nor its forte, and it’s bland and lifeless at times here. Even as a newcomer to The Division franchise, I had no difficulty determining what was going on, and the story seems fairly standalone. It is a near-apocalyptic Washington D.C., and civilization has sunk into strife dominated by armed clan struggles. The titular Division is a group of elite agents assisting the continuity U.S. government and allied communities help rebuild and maintain what settlements remain insulated from the bloodthirsty gangs like the Hyenas, True Sons, and Outcasts. The story hasn’t really hit its stride yet, and it could yet turn into something more interesting, but I’m not very impressed as is. 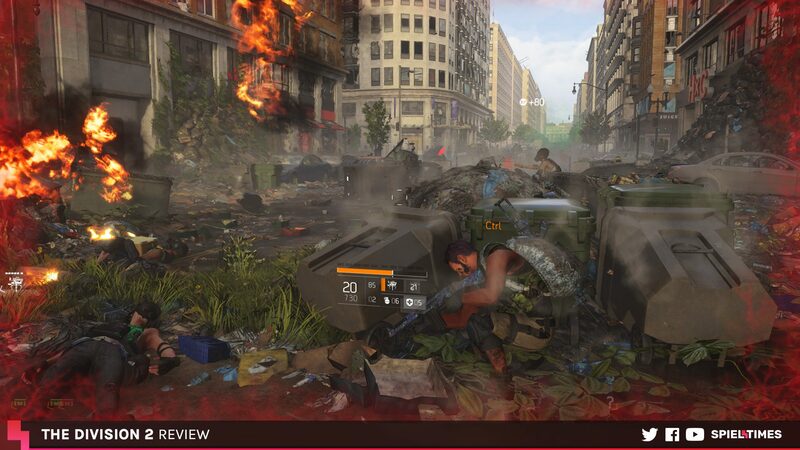 And that’s fine: you’ll be spending most of your time in The Division 2 running through missions, not watching cutscenes. UPDATE: Now that I’ve finished The Division 2‘s story, I can’t help but feel disappointed. Most of the characters feel lifeless and lack defined personalities. The story fails to deliver any sense of tension or reach a dramatic crescendo. Instead, you’re more likely to forget what exactly you’re fighting for, who the main protagonists are, and what motivation you’re supposed to have for engaging in battle with the enemy. Story is clearly not The Division 2‘s focus: it’s barebones stuff here. That may even be preferable for some fans of the genre, who would rather have a barebones story that doesn’t leave much of an impression than an attempt at a cinematic presentation for a genre that doesn’t really require or ask for it (I’m looking at you, Anthem). This is all subject to change, and I’ll keep updating this review-in-progress as I discover more of The Division 2’s world. I haven’t even unlocked much of the open world’s map yet, parts of which are gated behind level barriers and filled with intimidating endgame enemies. After recent releases in this genre like Anthem disappointed (I enjoyed the game, but it felt unpolished and rushed), The Division 2 seems like a breath of fresh air: it’s jam-packed with content and a lengthy campaign, it’s lacking in glitches or bugs, and it feels like a well-polished, balanced shared world experience. UPDATE: As my time with the game has gone on, I’ve felt no reason to change my feelings about it. In fact, I’ve grown more positive about some elements of The Division 2. When you conquer the enemy strongholds and reach the endgame, The Division 2 almost becomes a new game. Without spoiling too much about these higher world tiers, new enemy types and abilities keep players on their toes, and more exciting and difficult challenges like higher-difficulty bounties give even the most experienced and skilled players a run for their money. After more than thirty-five hours, my most exciting and memorable encounter in The Division 2 came after the main game was already over. That speaks volumes about The Division 2‘s staying power. Caleb Wysor is the Review Editor at Spiel Times. Born in the rocky mountains of western North Carolina, he has always had a passion for creative mediums and interactive media. Days Gone vs The Last of Us Part II: Which Blockbuster Release Is Drumming Up The Most Excitement Among Gamers?